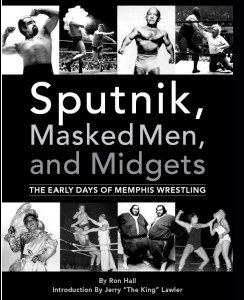 Memphis historian Ron Hall spent over four years documenting the insanity of Memphis wrestling from the early 1950s until the late 1970s–from Sputnik Monroe to Jackie Fargo to Jerry Lawler, Plowboy Frazier, & Tojo Yamamoto and everyone in between! Released September, 2009, Hall’s coffee table paperback book captures the beautifully wild wrestling action from Ellis Auditorium and the Mid-South Coliseum to other wrestling hotspots around the Mid-South. programs, wrestling advertisements, and other Memphis wrassling ephemera. Longtime King of Memphis wrestling, Jerry “the King” Lawler, adds his two cents about Memphis wrestling in the book’s introduction. The book also includes a must-have bonus cd with some of wrestling’s rarest music tracks from Sputnik Monroe, Jackie Fargo, Len Rossi, & Handsome Jimmy Valiant! Any professional wrestling fan must own this book! No jabronis allowed! Order yours now & be the 1st on your block to own this essential piece of wrestling history! Book price of $25.00 plus $3.50 shipping in the U.S.